Our best selling heavy duty catering gas BBQ. Very heavy and robust at 75Kg approx but easy to move around with large wheels, folding legs and side shelves. 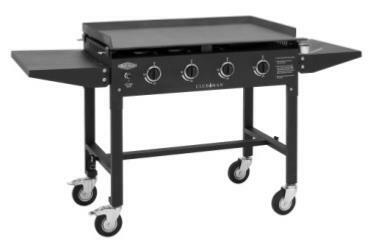 The heavy 5mm solid steel plate is easily removed and the rest of the barbecue just folds down for transportation. With a large cooking area of 90 X 50cm this gas barbecue is ideal for clubs, pubs and outside catering events. Excellent control with 4 adjustable burners giving a total output of 16.7 Kw. 4 cast iron burner catering gas BBQ with heavy duty 5mm solid steel hot plate. Heavy duty powder coated steel frame. 4 cast iron burners 3.5 kW each and push button electronic ignition.